A precious trend appearing in homes for 2016! Jewels of the earth will be decorating many interiors as we see minerals become a sought after style. This is a great way of injecting affordable luxury into living spaces as we move ever further away from those austere times we’ve become all too used to. Now what exactly does the mineral trend consist of? There are many different minerals which will become, or are already prominent throughout some homes. Quite often they are used as surfaces or sculptures but they are also used in light fittings. Although not the obvious choice due to the density of these materials the diffused light and glow they provide make them an excellent shade option for relaxed areas. Minerals provide a rustic and timeless effect and often gives a warm earthy feeling. Marble and granite are an example of a very common mineral in most homes and normally appear in kitchens or bathrooms, they are great for worktops and sink units. Incorporating other minerals into the home may seem more difficult but the reality is it’s not. Many light fittings now use various minerals, particularly in the shade as they give a warm glow and are of a high quality. Take a look at the image below of a ceiling bar pendant which would be ideal for lighting over a dining room table or kitchen island. 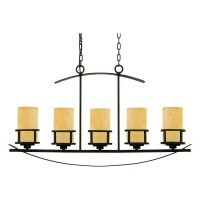 This rustic style light uses beautiful butterscotch onyx shades which provides a mellow and warming glow. There are plenty of earthy coloured minerals similar to this such as mica which gives a more transparent look which can be found in our Laguna, Whitney and Ahrendale range, however there are also those which provide sparkle, colour and decoration. From bright blues to emerald greens, there are a fascinating number of colours to be incorporated in this trend. Not to mention a vast array of shapes and textures to coordinate with. Often, using minerals as decoration is an easy way to create geometric and abstract architecture. This is great for modern settings meaning this trend is suitable for any and all properties. Keeping things earthly is an ideal way to coincide with the mineral trend, ammonite decorations and other fossils are a great way to do this. Don’t worry, you don’t have to fill your home with fossils! 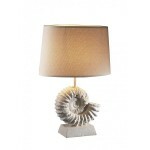 There are lamps with the same inspiration, for example the Ammonite lamp. One thing which is hugely beneficial to remember is that many minerals and precious stones comes in varying colours and tones. Take marble for example, it comes in many colours which can cater well for interiors giving the option of light or dark shades. A range of our lighting worth noting for this instance is the Savoy range which features both white and darker shades of marble effect printed glass, this is an innovative solution for allowing a high level of light output whilst keeping the marble look. The solidity of these mineral materials mean they are of a high quality and long lasting, so is it worth spending a little more on some light fittings? Yes, buying quality is buying once and can really be looked at as an investment buy. Something which is durable provides you with peace of mind that you’ll get the most out of it and lets you simply enjoy the aesthetics. You may however be thinking, it may last physically but with the ever changing trends and latest fashions will it not be out of fashion as quick as it’s in? No, thankfully this delightful trend is here to stay as we reiterate the phrase “timeless”. So which rooms are best for the mineral trend? In reality any room can utilize this trend and reap the benefits of it, however a kitchen or dining room is a great place to start within the home. The beauty of this trend being able to establish itself in any room is that it allows those of you with open plan rooms the freedom of getting on board with it without the concern that the adjoining room disagrees! It’s not just a trend which is geared for the home, it’s also popular in contract decor which further enforces the true luxury of it. Often mineral surfaces, floors, walls, sculptures and or lights are proudly displayed in hotel foyers, receptions and bars. I’m sure you’ve all experienced this a few times throughout your hotel or restaurant trips. Perhaps you are in the hospitality industry yourself and looking for a large feature light in this trend to hang in a foyer or long drop stairwell, no problem – this is covered! Many of our ranges such as the Kyle have large chandelier pendant lights for this exact situation. With regards to updating and time-proofing your home in this trend it’s worth keeping the scene of luxury up with complimentary materials such as silk or organza. Any small patterned material tends to work well with creating a vibe of delicacy so keeping this in mind is recommended. Introducing mineral sculptures such as an amethyst adds a decorative feature and a new dynamic to the room, feel free to accessorize with a small amount of mineral formations or go with a more prominent look with an amethyst based or marble topped coffee table for example. Whatever additions you plan to add, be tactile, people will touch it! Ensure you are able to care for the product, particularly if its a worktop surface or floor. The great thing with minerals in lighting is that they are very low maintenance, they wont be touched and will stand the test of time. In all senses of the phrase. Luxury without the labour. So get involved with minerals this year and dig up some more ideas for your home furnishings! 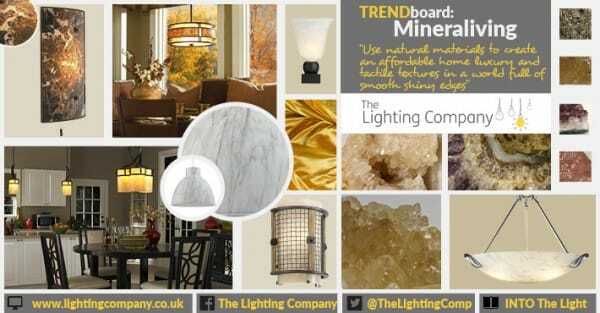 Treat yourself to some of this long term home luxury and browse through our collections for mineral inspired lighting: Mineral Lights. Be sure to keep up to date with our latest trends for 2016! Check back each month for the latest post and consider subscribing for our interactive magazine “INTO the LIGHT” for all things lighting.